Linda Harasim, professor at the School of Communication at Simon Fraser University inVancouver, developed online collaborative learning theory (OCL) in 2012from a theory originally called computer-mediated communication (CMC), or networked learning. Intellectual convergence: the phase where intellectual synthesis and consensus occurs, including agreeing to disagree, usually through an assignment, essay, or other joint piece of work. The end result is learning which manifests in applied knowledge through applications in the real world, although a learner is never truly finished generating, organizing, and synthesizing ideas, and continues those processes at progressively deeper levels. Harasim believes that the teacher is critical to this knowledge construction, not only through facilitating the process and providing resources to the group, but also through ensuring that the core concepts and practices of the subject domain are fully integrated. 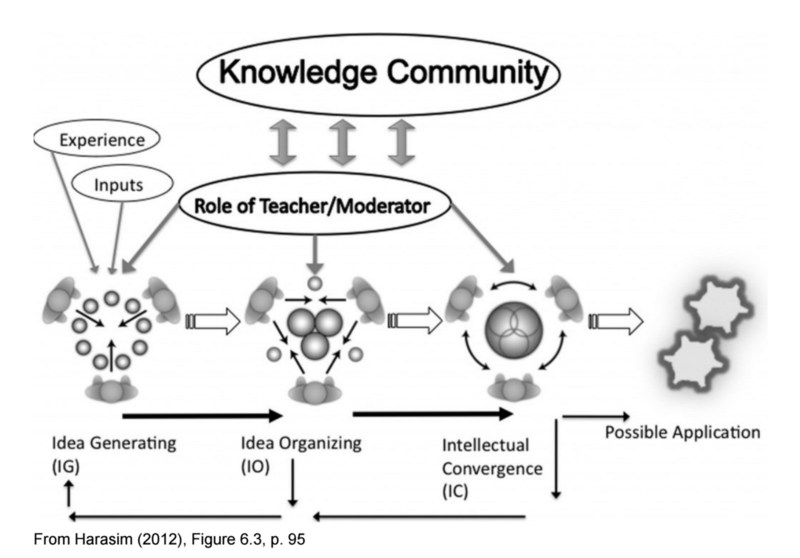 The teacher is here understood to be a representative of the knowledge community or subject domain under study. OCL, like many other online teaching models, operated in an environment that is asynchronous and place-independent. Students are typically free to engage in class discussions on their own time (up to a point) and can log on anywhere they have internet access. Where the OCL model might differ from other models, however, is that discussion is seen as central to learning, and textbooks and other materials as supplementary. This differs from traditional online courses, where readings might be the primary material, and discussions secondary. Students in traditional online courses might exhibit the tendency to forego discussion, which they see as extra work outside of what they will be graded for. In a keynote presentation to the Brazilian Association of Distance Education in 2006, Harasim noted that usage patterns in virtual classrooms practising OCL saw students sending about 85% of messages, versus instructors in face-to-face learning taking up 80%+ of airtime. The distribution of communications was also found to be more equitable, with fewer outliers than in face-to-face learning. Another shift was in traditional student and teacher roles. In OCL classrooms, the teacher’s role shifted from being that of a provider/entertainer to being more of a facilitator as students took more responsibility for the learning process and for generating discourse. On par with college classrooms. Online collaborative learning can promote deep learning and encourage discussions at the level of, if not higher than, discussions found in face-to-face campus classrooms. The asynchronicity that OCL offers as well as its other benefits outweigh any downsides, like lack of physical cues. High-level skill development. OCL supports high-level skills such as critical thinking, analytical thinking, synthesis, and evaluation. Hard to scale. OCL requires highly skilled instructors with a deep level of knowledge in their field, and students must be limited in order for discussions to be effective. Not as friendly to science and engineering disciplines. Because OCL lacks an inquiry-based or problem-based approach, it is less accommodating as a structure for faculty in the science and engineering fields, though it would not be impossible to combine OCL with such approaches. In Learning Theory and Online Technologies, Linda Harasim offers an overview of e-learning and outlines several major approaches to e-learning. Tim S. Roberts compiles articles from a variety of practitioners that are focused on both theory and practice in the area of online collaborative learning. Online Collaborative Learning: Theory and Practice offers a great resource for both researchers and instructors. Harasim, L. (2012). Learning theory and online technologies. Routledge. Harasim, L. M. (1995). Learning networks: A field guide to teaching and learning online. MIT press. Harasim, L. (1996). Online education. Computer networking and scholarly communication in the twenty-first-century university, 203-214. Harasim, L. M. (1990). Online education: Perspectives on a new environment. Greenwood Publishing Group Inc..
Collaborative Learning: an educational theory & pedagogy in which learners discuss and work together to learn & apply relevant concepts to solve problems of their field, deepen their understanding & create new products or processes. Collaborativism: Humans work together for a common purpose successfully. AI used to Augment HUMAN Intentions, NOT to replace humans.